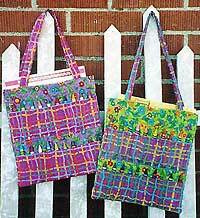 The Large Coloring Bag Pattern is by Clothesline Quilts (Evonne Cook). What little one wouldn't like to have one of these coloring bags to take their books & crayons to church, quiet time or just plain coloring time? The Large Coloring Bag is 10 inches x 10.5 inches plus handles & holds 2 large (8.5 x 11 inch) books & 20 crayons. Quick & easy sewing makes this Large Coloring Bag an inexpensive gift or stocking stuffer for that special child! This pattern comes with instructions, but does not include pattern pieces.